The Canucks have had a lot of experience watching opponents come from behind to beat them in recent games. On Tuesday, they tested that game plan for themselves. It just about worked to perfection until the Penguins demonstrated they also knew how to play the role of comeback kids as well. Sidney Crosby scored the game-tying goal with 55 seconds left in regulation and then notched lone shootout marker to lift the Penguins to a 5-4 win over the Canucks in a see-saw affair at Rogers Arena. The loss extended the Canucks' winless skid to a season-high five games and dropped their season record to 23-13-9. Crosby's game-deciding goal in the shootout was the final dagger to the heart of the Canucks who first looked like they would go quietly into the night against the Eastern Conference's top team, and then staged a furious third period rally to take the lead only to let what appeared to be a certain victory slip right by them. After spotting the Penguins a two-goal lead less than 26 minutes into the contest, the Canucks would score the next four consecutive goals – including three in the opening 14 minutes of the third period – to take a 4-2 lead into the dying stages of the game before suffering an epic collapse. Kris Letang would get the Pens back within a goal with 71 seconds left in regulation with a point blast that struck the post and went in. Crosby would complete the comeback for Pittsburgh 16 seconds after that taking a midair feed from Chris Kunitz just to the left of Eddie Lack off his skate then kicking the puck up to his stick and jamming it past the Canucks' netminder all in one motion to stun what had been a boisterous crowd expecting a slump-busting victory for the home team. 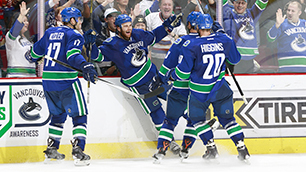 Jason Garrison, Chris Tanev, Chris Higgins and Zack Kassian had goals for the Canucks, while Brian Gibbons and Evgeni Malkin had the other tallies for the Penguins. Lack made 31 saves on 35 shots through regulation and overtime in the loss. Marc-Andre Fleury stopped 22 of 26 shots through 65 minutes, and all three Canucks shooters in the shootout, for the victory. The Canucks close out their short two-game home stand on Friday when they host the St. Louis Blues. NOTES AND NUMBERS: The Penguins' victory was their fourth in a row against the Canucks... The Canucks fell to 0-4 in all-time shootouts against the Penguins... Jason Garrison's goal snapped a 13-game goal drought and was his 100th career NHL point... The Canucks were credited with 36 hits, half of those coming from three players – Tom Sestito, Zack Kassian and Darren Archibald... Sidney Crosby was 71 seconds away from being held point-less for the ninth time this season before he tallied a goal and an assist to extend his point streak to six games (4-7-11)... 11 Sochi-bound Olympians played in Tuesday's contest – five for the Canucks and six for the Penguins... David Booth and Dale Weise were healthy scratches. BETTER LATE THAN NEVER: Tom Sestito was credited with a goal on Tuesday although it didn't come in the game against the Pens. Earlier on Tuesday, the NHL retroactively credited Sestito with a goal in their game against the Ducks on Sunday that was initially credited to Henrik Sedin. The goal meant that, in addition to adding on to his career-high goal totals, Sestito has now set a personal career-high in points in a single season with five. His previous-high was four set with the Blue Jackets back in 2010.11. KING OF THE HILL: Penguins head coach Dan Bylsma looked resigned to have to wait until at least Friday in Edmonton before he would get another crack at becoming the Penguins' all-time coaching wins leader until his team came through for him with a huge late rally to give him his 233rd victory behind Pittsburgh's bench to move him one win ahead of Eddie Johnston.